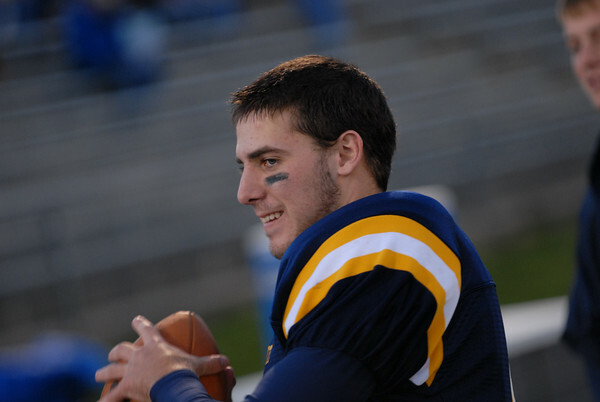 Dan was named to the Associated Press Class B team and the Detroit Free Press Dream Team in 2007. He was also the Offensive Player of the Year in the Lansing State Journal. Dan was brought up mid-season as a sophomore and inserted right away. In his first game, he drove the Panthers 95 yards late in the game to beat Williamston. With a wealth of top receivers, his senior season was one for the record books. His 39 touchdown passes in only 11 games set the State season record. His career total of 69 TD passes is second on the all-time State list. Dan’s low key approach on the field allowed him to patiently wait for his receivers to get open and zip a pinpoint pass. An excellent junior season set the stage for a prolific senior season; 166 completions in 266 attempts for 2,565 yards and 38 touchdowns yet he was only intercepted three times. Dan also ran for 714 yards on 101 carries for an additional 11 TDs. His career passing stats; 373 completions in 614 attempts for 5,052 yards ( 2.9 miles! ) with 69 touchdowns. Also, Dan rushed for 2,395 yards and 25 touchdowns.